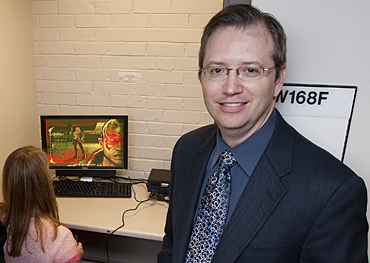 A new study by an international research team — including an Iowa State University psychologist — found further evidence that video game “addiction” exists globally and that greater amounts of gaming, lower social competence and greater impulsivity were risk factors for becoming pathological gamers. The two-year longitudinal study of 3,034 third through eighth grade students in Singapore found approximately nine percent of gamers to be pathological players according to standards similar to those established by the American Psychiatric Association for diagnosing gambling addiction. And some serious problems — including depression, anxiety, social phobias and lower school performance — seemed to be outcomes of their pathological play. Douglas Gentile, an Iowa State associate professor of psychology, and five researchers from Singapore and Hong Kong collaborated on the study, which will be published in the February 2011 issue of Pediatrics — the journal of the American Academy of Pediatrics. It appears on the journal’s website today. The study was jointly funded by Singapore’s Ministry of Education and media Development Authority in a grant given to professors from the National Institute of Education. The researchers report that the percentage of pathological youth gamers in Singapore is similar to other recent video game addiction studies in other countries, including the United States (8.5 percent), China (10.3 percent), Australia (8.0 percent), Germany (11.9 percent) and Taiwan (7.5 percent). “This study is important because we didn’t know until this research whether some types of children are at greater risk, how long the problem lasts, or whether pathological gaming was a separate problem or simply a symptom of some other problem — such as depression,” said Angeline Khoo, associate professor of psychological studies at the National Institute of Education in Singapore and principal investigator of the overall project. The researchers gathered data from students attending 12 Singapore schools, including five boys’ schools. The subjects were surveyed annually on their video game play and behavior between 2007 and 2009. Surveys were conducted in classrooms by teachers who had been trained by the research team. The study had a 99 percent response rate. Using the American Psychiatric Association’s “Diagnostic and Statistical Manual of Mental Disorders” as a guide to define the addictive condition, the researchers found between 7.6 and 9.9 percent of the student sample could be defined as pathological gamers over the two-year period. Eighty-four percent of those subjects who were first classified as pathological gamers were found to still be classified that way two years later. Yet in that same two-year window, only one percent of the sample became new pathological gamers. Through their analyses, the researchers conclude that video game addiction is a serious behavioral problem that is separate from other afflictions. Among this sample, pathological gamers started with an average of 31 hours of play per week, compared with 19 hours per week for those who never became pathological gamers. But Gentile says those thresholds don’t necessarily translate across all cultures, particularly in American children. Gentile is visiting Singapore to meet with his research colleagues and present their findings during the final two weeks of January.